The Family Room decorated in red and cream is our largest room. 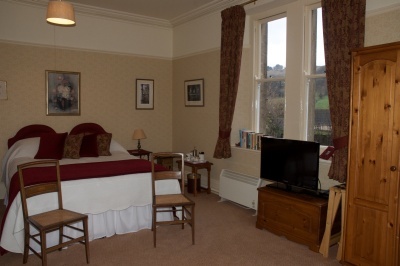 This room has two aspects overlooking the hills and the garden. The room sleeps two in a king sized bed, which can be split into two singles if required. There is also a well sprung single sofa bed and room for a further single bed if needed. This is ideal for a family of four or even four adults if needed. The large private bathroom and separate toilet are down 4 steps from the bedroom; these are the original facilities for the house. For more photos of the Family Room see the Galleries page.